(previously known as pythonbrew)- to put it simply, it’s Python version management tool. 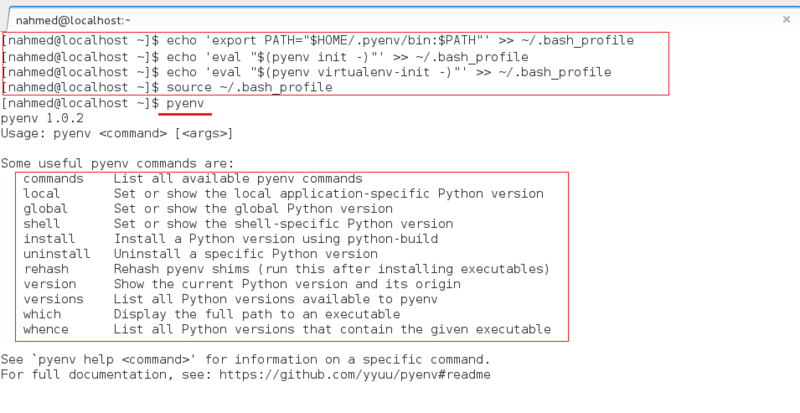 penv lets you have multiple Python installations i.e. multiple Python versions, from which you can set the global Python version (the default version to use), and also the local Python version i.e. project specific. Apart from this you can also create virtualenv – it has a separate sub-command for it. Once installed, penv is a bash command not needing python to for execution – it’s user-level command, so no need to use sudo. presuming you’re installing it on a fresh CentOS 7 machine – in case you have them installed, start with the installation step (anchor here). Note: Virtual environments will also show up as versions after they’re added.